Photo: H. G. Burleigh House, ca. 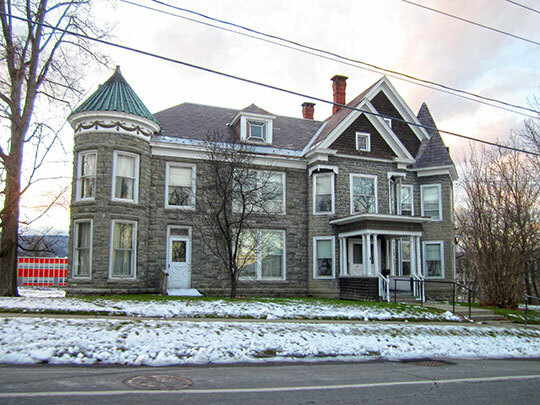 1894, 307 Champlain Avenue, Ticonderoga, NY. Part of the Ticonderoga Multiple Resource Area, listed on the National Register of Historic Places in 1988. Photographed by User:Doug Kerr (own work), 2011, [cc-by-2.0 (creativecommons.org/licenses/by/2.0)], via Wikimedia Commons, accessed February, 2013. Essex County Administrative Offices are located at 7551 Court Street, Elizabethtown NY 12932; phone: 518-873-3600. The county was organized in 1799 being split-off from Clinton County. Today, the county is divided among 20 municipalities. At its inception, there were but four: Elizabethtown, Willsborough, Crown Point, and Jay. Willsborough was the first planned settlement, established on lands bought by William Gilliland in 1765. At more than 1,800 square miles, Essex is the second largest county in the state. Much of the county is located within the Adirondack Park. With an average elevation of 3,000 feet, it is the highest in the state. It is home to Mount Marcy, at over one mile high, the tallest in the Adirondacks.